THE AMERICAN HEARTLAND – WORLD CLASS MANUFACTURING CENTER? OR DESERTED AND ABANDONED RESOURCE LOST TO THE NATION’S FUTURE? Innovation was always in evidence throughout the heartland: necessity drove the inventions that hardy pioneers needed, such as Cyrus McCormick’s reaper – from which the McCormick Harvester (manufacturing) Company would rise. JH Patterson would create the cash register giving rise to the great National Cash Register Company (NCR) in Dayton, Ohio. The John Deere Company first created steel plows for prairie farmers and grew to be one of the world’s premier earth moving and heavy equipment manufacturers based in Moline, Illinois, by the Iowa border and along the Mississippi River banks. This region was the essence, once-upon-a-time, of America-the-Abundant: Nearby hills contained the ores necessary for processing into metals, for iron and steelmaking. Rich veins of coal were within easy reach for firing up huge blast furnaces. Immigrant workers pouring into the country were eager workers for the factories. The Great Lakes provided inland seas for transport around the region. Great rivers throughout the region carried finished goods to markets in the US and Western Hemisphere and far beyond – think of the Mississippi as the central river of commerce flowing direct from the Heartland, down from the north through St. Louis and other cities to New Orleans and onto waiting ships bound for markets everywhere. The peak of the manufacturing era has passed for too many of America’s manufacturers, their workers, the unions, local civic leaders, tax collectors, railroad workers, hometown retailers, bankers, and on and on… Alas, nothing is forever. As author Kurt Vonnegut often wrote, And so it goes… But does it have to? Can we stop the decline? One important factor in the decline: Wall Street mavens had other ideas for the publicly-traded manufacturing companies that arose from prairie and heartland ambitions and gritty work. Dump those workers – good for stockholders – the headlines of every 10,000 laid off workers in America’s factory towns were often cause for cheers in the narrow canyons of downtown Manhattan. For at least the past 30 years this anti-worker attitude drove some of the financial analysis and investment decision-making that led to a distinct Wall Street vs. Main Street confrontation. Corporate managers were constantly pressured by Masters-of-Financial Wizardry to downsize, outsource, shut the lines, move plants to foreign lands, and otherwise hollow out much of what we once could boast of: dominant American industrial prowess. There is lot left, to be thankful for – but too much gone, too. How many things can you buy today marked “Made in the USA?” Clock radios? Invented here (by GE) now made who-knows-where – but not here. How many color TV sets have the Made in the USA label? (None.) A decade ago I was in a large Pennsylvania warehouse loaded with RCA (remember that name?) color TVs. Wow! Then I looked at the label – Hecho en Mexico – and some ersatz other label purporting this was worked on an Indiana plant. Even that slight-of-hand seems to be gone now. Sure there’s a good amount of manufacturing still going on in the heartland. But how much of the work that should be there now has been moved to foreign shores? Or taken over by foreign manufacturers that come here and get generous tax breaks and looser trade barriers (than in their countries)? And so we come to the critical question of coming to the rescue of the three American auto and truck manufacturers. There’s a lot at stake here. Depending on how you figure things like this, maybe 1-in-6 to 1-in-9 American jobs depend on the Big Three’s survival. We recently shoveled wheelbarrows of federal – taxpayer – money to the banking and financial services (and insurance) sectors, in the form of loans, guarantees, investment, direct support and more. $25 billion of that was directed to the nine big banking firms. So far, 150 financial services sector firms are lined up for federal aid. This country, this congress, this administration, the American People, now have the opportunity to do something important about the tragic loss of American manufacturing over the past three decades: We all can help stop the bleeding. We can extend the requested financial lifeline to the three automobile companies in Detroit. Even if it is temporary until President-elect Obama and his Brain Trust gets to town in January. Millions of jobs hang in the balance, and not just in the heartland – those factory jobs are throughout cities and town and states and many crossroads of rural America. Hey, there in Washington — don’t we have enough failed mortgages to deal with right now? Kiss off Detroit – and then watch what happens. Yesterday was December 7 – the anniversary of the Pearl Harbor attack on the United States by armed forces of the Empire of Japan. Just a week later Nazi Germany declared war on the United States. The nation plunged into a true world war, one to be fought on all continents by America’s citizen-soldiers. The war was also won on the home front — It was the American factories, where the heartland workers (and their peers in other states) turned out the endless flow of weapons and materiel that helped to turn the battle. Aircraft carriers, tanks, Jeeps, rifles, cannon, planes, and everything else that was needed. And after defeating the WW II enemies, we as a People turned around and helped to rebuild the industrial base of western Germany, much of democratic Europe, and of Japan. 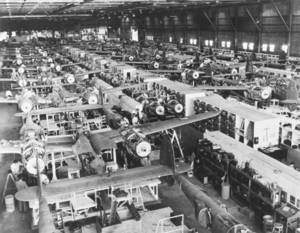 After the Korean War we helped build a mighty industrial base there in South Korea. Can’t we continue to do that at home now? Be aware friends, this can be a dangerous world, and while we are the world’s superpower today, there are no guarantees for tomorrow. Large nations on distant shores are building mighty industrial bases. In the worst case scenarios, would you feel more secure (or less) if many more of our factories disappeared and their skilled workers went into part time retailing or forced retirement? And their factories were closed? The machinery dismantled. No further investment made. And then the materiel we would need in the future was turned out in…who knows where? Stay closely tuned to the critical discussions going on not just this week in Washington about immediate help – but to the longer-term and very strategic public policy discussions about the future of American manufacturing.